The plight of several species of albatross has worsened significantly in the last year, conservationists say. They say populations of six of the 21 albatross species have shown "a further alarming decrease". One, previously thought to be safe, is now believed to be at high risk of extinction. The culprits are said to be longline fishing boats, blamed for thousands of bird deaths annually. The warning is sounded by BirdLife International, an alliance of conservation groups working in more than 100 countries. BirdLife representatives from South Africa, France, Australia, New Zealand, Argentina, the US and the UK have been meeting at a workshop in Cape Town, to bring together global tracking data on albatrosses and petrels. BirdLife says research its experts have analysed shows the mounting peril the birds face, with all 21 species now thought to face some risk of extinction. BirdLife's assessment is based on the classification used for the Red List of threatened species compiled by IUCN-The World Conservation Union. The five relevant categories are critically endangered (a species facing an extremely high risk of extinction in the wild); endangered (very high risk); vulnerable (high risk); near-threatened (close to qualifying as vulnerable); and least concern (a category including widespread and abundant species). 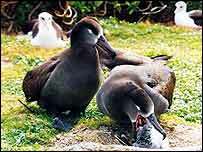 Laysan albatross, of least concern three years ago, is today classed as vulnerable. The most threatened species of all, the Amsterdam albatross, already classed as critically endangered, now faces an additional threat from disease. Only about 20 pairs breed each year, and chicks are dying more often. 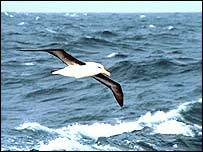 BirdLife's director, Dr Michael Rands, said: "The number of seabirds killed by longlines is increasing, as is the number of albatross species in the higher categories of threat due to their continued use. "Longline fishing, especially by pirate vessels, is the single greatest threat to these seabirds." 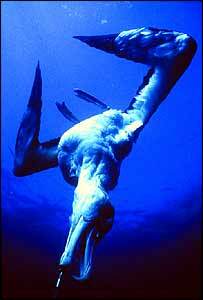 Longliners are blamed for killing 300,000 seabirds annually, a third of them albatrosses. The birds swallow the baited hooks on the fishing lines, which can be 80 miles (130 km) long, and either die of their injuries or simply drown. BirdLife and other conservationists are working with the fleets to promote bird-friendly fishing methods. The British trans-Atlantic oarsman John Ridgway is spending a year sailing the southern ocean to campaign for action against illegal fishing. He is due soon in Cape Town, where his expedition will be demonstrating best practice aboard a longlining boat.